Today as the world seems to get smaller, we’re seeing more and more unusual fruits in our supermarkets and specialist greengrocers. We take a quick look at some of those unusual fruits gaining in popularity: physalis, dragon fruit, sharon fruit and ugli fruit. 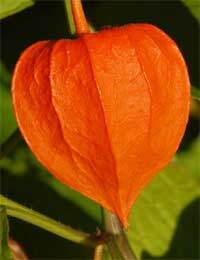 With its heart-shaped papery outer covering over a bright golden ‘bulb’, it’s easy to understand why physalis fruits are sometimes called Chinese Lanterns. Also known as Cape Gooseberry, physalis originated in Brazil. It was known in England in the eighteenth century, and soon spread around the world, via Africa, Australia and the Hawaiian islands before reaching north America. The fruits are produced in late summer and have a sweet-and-sour taste. They’ve been described as a cross between a tomato and a gooseberry. When ripe they can be eaten raw or added to fruit salads; they also make good sorbets and wine. Chef Lesley Waters suggests a quick jam to serve with freshly made scones. Cut 8 physalis fruits in half and place in a saucepan with 1 oz butter, 2 oz caster sugar and 1 tablespoon elderflower cordial. Boil gently for 5 minutes, stirring occasionally. Allow to cool before serving with clotted cream. The dragon fruit is a relative newcomer to our supermarkets and greengrocers. A hand-sized oval that’s bright pinky-red in colour, with a few scales (leaves) on its sides, it does bear a striking resemblance to our idea of a picture-book dragon. It seems to have originated a long time ago in Central or South America. The Aztecs certainly knew about it: dragon fruit is mentioned in some of their writings, going back to the thirteenth century. Today it’s spread and is cultivated in warm countries all over the world. The fruit of a cactus, a dragon fruit’s flesh is watery, slightly sweet and very mild. It may be white or purple and dotted with tiny seeds. It works best when combined with mango or made into a sorbet with other tropical fruits. Scoop the flesh out of the non-edible skin using a teaspoon. Try mixing it with thick Greek yoghurt, fruity muesli, and honey for a lazy Saturday breakfast. Sharon fruit is the trade name for a seedless variety of persimmon that was originally grown on, and named after, the Sharon Plain in Israel. The fruit varies in colour through all shades of orange from a pale yellowy to a rich red. They’re high in vitamin A and one Sharon fruit will give you your day’s requirement of vitamin C. And twice as much fibre as an apple! Most persimmons have a high astringent quality and will leave your mouth dry if you try to eat one that isn’t soft enough, however Sharon fruit can be eaten, like a peach, when firm. When very ripe and soft the flesh will be a thick jelly-like pulp. They can be eaten fresh, cooked or made into a smoothie. Try adding chopped firm Sharon fruit to salads, rather like tomatoes, or blend soft ones with yogurt or double cream for a fool. Somebody really needs to rethink the name of this grapefruit/tangerine cross. It might be an accurate description of the fruit with its rough blotchy skin but it doesn’t make it very appealing to today’s brand-conscious public! Said to have been found originally growing wild in Jamaica, the ugli fruit is now cultivated in both Jamaica and Florida. It has the easy-peel benefit of the tangerine while being closer to the size of a grapefruit. The taste varies from slightly sharp to sweet. Peel and use as you would oranges or grapefruit: eat as it is, for breakfast or in fruit salads, or juice for a refreshing drink at any time of day. Trying to find a delicious tasting fruit which I ate in Israel recently. Is a similar shape to a flattened out medium size banana, very dark colour about 1.5 cms thick and has very hard stones inside about every 5 cms which can do serious damage to your teeth. It has the flavour of a sweet banana and a pleasant texture. Can you tell me what the name is and where I could find some in England as I can't find any in Leeds, been in all the Asian and caribean shops. Thankyou Doug Brown. Hi there, Am looking for importers of unusual fruits all around the world to import from me Aframomum fruits. These fruits has very high levels of minerals and can help reverse many sexual related problems.